If you know me well you know that my first choice would be to opt out of receiving birthday gifts, whereas my second choice would be to receive something practical. My last choice would be sequins. 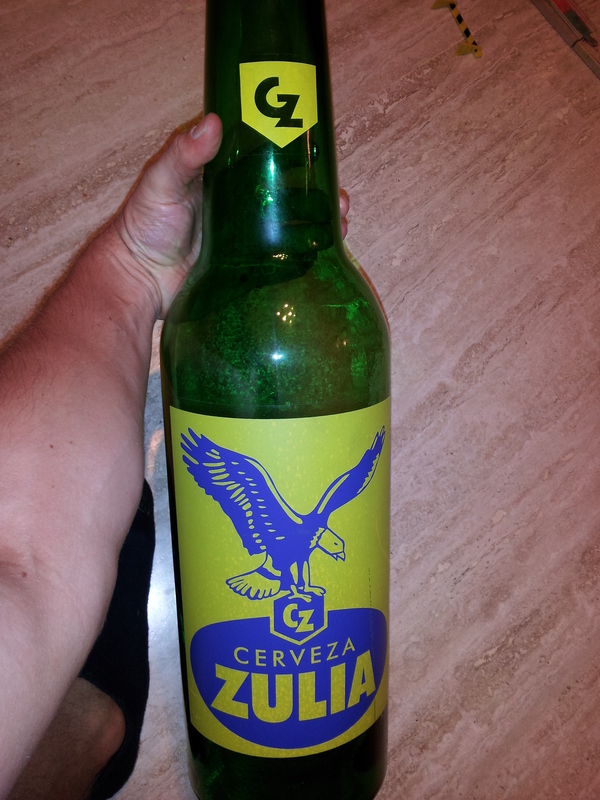 Some people know from the second annual Venezuelan Beer Tasting, which only served to confirm the findings of the first, that my number one choice in Venezuelan beer is the somewhat decent Zulia. This year, a friend named Innes Isom (his name isn’t relevant, but it is interesting) gifted to me one big, useless sequin in the form of a large Zulia bottle. It’s lovely really and I’m currently looking for ways to make it more practical. Perhaps as a prop for a video that make me look like a miniature person? Perhaps a fish tank? A lamp? A container for soon-to-be-worthless Bolivar coins? A really deep note for a bottle blowing music ensemble? Buy a bunch more, fill them with beer and throw a unique twist on an Edward 40-Hands party? Sky’s the limit on this one, folks. Best Venezuelan college dorm room decoration ever. Maybe give it to Graham to use as a whiffle bat. Or give it to Graham to use as a tee ball tee. Or fill it completely with beer like you said and get a bunch of realllly long crazy straws. Or write a note in normal-sized handwriting on a huge piece of paper and then find a huge cork and set it out to sea. Oh, and sign it as Gulliver. Fill it with lamp oil and use that cork you found in the last sentence to hold a wick in the top. Stick really fat candles in the top and burn wax down all of the sides. Use it to make the world’s easiest ship-in-a-bottle. Stick a bunch of long reeds in it like a vase. Pay $163 to mail it to Steve and have him brew some beer in it. Take those realllly long crazy straws from earlier and put it on your desk at work and casually drink water from it throughout the day. Fill it with jelly beans and have a class contest – Cuanto Gamitos de Cerveza. The winner gets all of the Gamitos and has to promise not to tell their parents where they got the bottle. Turn it into a magic flight launch bottle. It’ll take some Macgyvering and a car battery will probably be involved. Fill it with food scraps and worms and hide it under the sink. When Kat finds it and says “WTF?” tell her you got homesick and decided to start a wormbin. Speaking of weird treehugger stuff, use to collect rain water and flush your toilets with it. You could play spin the bottle but I can’t think of a situation where that wouldn’t end awkwardly. Get about 16 more and fill them with different levels of water and give Graham some mallets so you can play it like a xylophone. You can call it the Cerezaphone (patent pending). You are a genius. It wouldn’t be too difficult to rig up a rainwater toilet flush operation. Our water has been turned off for most of the last three days so now is the time, I think. Those are some creative awesome suggestions, Kane. This entry was posted on October 14, 2013 by Michael Stein-Ross in Michael and tagged Beer, Oddities.